Amid quality concerns, these PCs remain available for purchase. Walmart's Overpowered gaming PC line is not going away any time soon. Amid rumors that the desktop PCs were pulled from the retailer's website for quality concerns, both Walmart and Esports Arena have issued statements clarifying the reason for their temporary absence. Speaking to Tom's Hardware, a Walmart spokesperson said, "Yesterday, we briefly removed the OP desktops to update product information. They are now back on the site." Rumors began circulating a few days ago that Walmart had pulled their Overpowered line of gaming PC desktops from sale. Various YouTubers had taken to social media with video and screenshots of the retail pages showing the products unavailable for purchase. The gaming desktop PCs have received negative feedback from tech websites and YouTubers alike for the low quality of some of their internal components and their overall value. 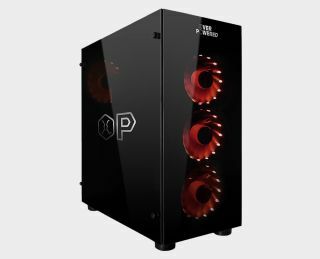 We were able to confirm that all Overpowered gaming desktop PCs and laptops are available for purchase on Walmart's website, though it appears several models have dropped in price recently. The Overpowered DTW1 model is now listed at $1,199 from $1,399, and the DTW2 model dropped from $1,899 to $1,699. The DTW3 model, which originally went for $2,099, is now $1,899. The Overpowered gaming laptop model with 32GB of RAM was $1,499, but has been reduced to $1,299. It's unclear whether these price drops were part of the product updates or if they are just last minute sales before 2018 comes to a close. We are currently reviewing an Overpowered DTW3 model and expect to have our full review up on the site soon. Thanks to Tom's Hardware and Techspot.